As educator and artist I am engaged within an active conversation of the possibility that is offered within contemporary art. My view is nurtured through the framework for inclusive interactions from diverse experiences and areas. Artistically I am drawn to the details of concepts, actions, or forms drawn from the everyday. Pedagogically this sense for detail manifests itself within the determination to educate students that varied and complex aspects of living empower our work as artists and provides a richer experience as human beings. Art is not an exclusive practice but an inclusive one. Teaching, like creating art, requires communicating complex ideas simply and clearly. It also creates the responsibility of providing students with the tools necessary to move concepts forward within their chosen studies. Critical thinking, passion for knowledge, and the ability to evolve from concept to form are areas I stress in interactions with students. I motivate students to acquire the fundamental ability of problem solving. Honing students’ ability to formulate ideas and think critically allows an almost infinite avenue in which to explore the world. In order to do this I focus on a balance between the mental and physical nature of art. Homework assignments, carefully chosen and designed, help to impart implicit knowledge and skills needed to grasp the fundamentals of the conceptual nature of sculpture. Physical hands on experiences allow the opportunity to demonstrate how concept and technique formulate and evolve during the actual process of working. I work to challenge and to be challenged by students. Creating and thinking critically about art is not a spectator sport. Students cannot be passive recipients of knowledge. Within the nature of liberal arts based programs I teach students that to learn one must be willing to do more than take notes and memorize information. Art students must continually challenge conceived themselves as to what art is and how it functions. Doing so means changing the mindset of passive assimilation that many students have developed. I do this by providing students the means to integrate personal experiences and practices within each studio assignment. I see active results from those who claim ownership of assigned projects. Ownership engages a sense of responsibility that move beyond what is “assigned”. Students are apt to push themselves beyond traditional limitations and arrive at the end of the experience with a more acute sense of awareness as to who they are as an artist and as an individual. This commitment is developed by allowing student’s unique backgrounds to surface; whether from a music major exploring ways to incorporate sound within a cast bronze form, a biology student merging empirical science within an installation, or an art student exploring possibilities of merging printmaking and sculpture into a cohesive form. It is a realization that we are more than the sum of our parts. I continually stress that sculpture is more than stone or metal. 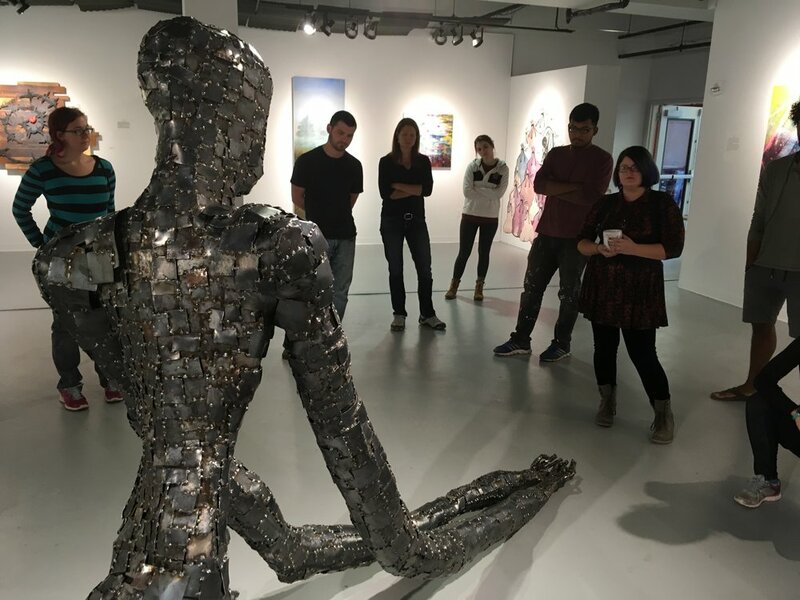 Sculpture is an interdisciplinary program that encompasses a wide arrangement of materials, philosophies, and disciplines. In creating an effective learning environment, I create situations that push students beyond their expectations and limitations in the belief that, when given the opportunity, they are capable of great personal achievement and artistic growth.